Post halts normal activities to hold three-day "suicide stand-down training event"
(CNN) -- A major United States military post is shutting down for three days following a rash of suicides, the post announced. 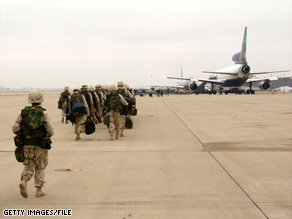 Troops from Fort Campbell, Kentucky, depart for the Persian Gulf in 2003. Fort Campbell, home of the Army's 101st Airborne Division, is holding a three-day "suicide stand-down training event" starting Wednesday -- the second one it has held this year, a post spokeswoman told CNN. At least 11 deaths of Fort Campbell soldiers this year are confirmed or suspected suicides, spokeswoman Kelly Tyler said. That's out of 64 confirmed or suspected suicides in the entire Army, according to official statistics. At that rate, the Army is on pace for a record number of suicides this year. The post commander, Brig. Gen. Stephen Townsend, addressed all 19,000 soldiers of the 101st Airborne Division on Wednesday, Tyler said. "His intent was to be able to look them in the eye and make them aware that everyone cares about the issue, and make sure they know -- corporal to general -- what help is available," she said. "To make sure that people know we want them to keep living." Soldiers often refuse to admit they are having problems because of the culture of the military, she said. "You still have the stigma in the Army of asking for help -- it's an institution of strength and honor. And they need to understand that there is strength and honor in asking for help," Tyler said. "It's easy to lose focus of that. We are a nation at war, an army at war. The guys around you need you to be there. They need you to ask for help, or for them to ask for help if you can't." Fort Campbell's commanders are trying to impress upon the troops that this is more than a mandatory exercise. "It is such an unusual event to look them in the eye and say their life matters, their buddy's life matters," Tyler said. "We're not checking a box, not punching a ticket. This is an effort to let the soldiers know that the command cares." Military suicides are among the top worries for a leading veterans' group. "This is a grave concern for our organization," said Ryan Gallucci, a spokesman for AmVets. Combat stress manifests itself in different ways, he said, citing the case of a U.S. soldier charged with killing five of his comrades at a mental-health clinic in Iraq earlier this month. "The incident in Baghdad brought a lot of attention to combat stress, but this is the other side of the coin," he said. He agreed that the military's emphasis on personal toughness makes it harder for soldiers to ask for help when they need it. "Mental strength is a necessary character trait in combat. To suddenly say it's OK to admit you have a problem contradicts your training," he said. But he said the Army needs to do more to prevent suicide. "The military has certainly done a better job of identifying it, but you see the numbers -- the numbers speak for themselves," he said. More soldiers killed themselves in January of this year than died in battle, Army statistics suggest. Suicides for Marines were also up in 2008. There were 41 in 2008, up from 33 in 2007 and 25 in 2006, according to a Marine Corps report. Gen. Peter W. Chiarelli, vice chief of staff of the Army, expressed concern about the suicide rate in March testimony before the Senate Armed Services Military Personnel Subcommittee. "We must find ways to relieve some of this stress," Chiarelli said. Fort Campbell is on both sides of the Kentucky-Tennessee state line, southeast of Paducah, Kentucky.